The world of penguins is a broad one, with its 17 diverse species. All of the species are equipped with their own defining characteristics, whether they pertain to appearance or adaptations. King penguins (Aptenodytes patagonicus) possess a number of practical physical survival adaptations that help ensure the well-being of the group. King penguins are sizable birds that hail from islands that are close to Antarctica, including Macquarie Island and Crozet Islands. They are incapable of flying, in true penguin fashion. Mature king penguins generally weigh between 20 and 38 pounds, with typical weights of approximately 26 pounds. 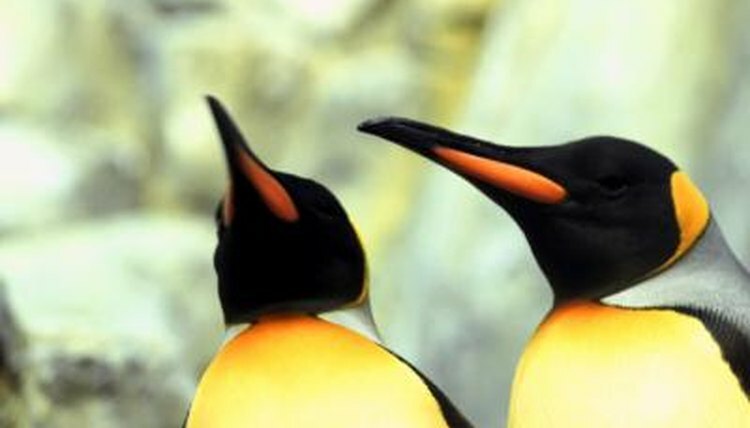 King penguins possess blackish heads with conspicuous yellowish-orange markings on the edges of them. Their menus mostly consist of tiny fishes and squid. King penguins reside in harsh and severely cold landscapes. Luckily, they have four levels of feathers that all work together to keep their bodies feeling more comfortable. The top level of their feathers is water-resistant, while the remaining three consist of down feathers, and therefore stop heat loss from occurring with their insulation properties. While the majority of penguins construct nests for raising their offspring, king penguins do not. They instead incubate their eggs using their feet. They tuck their eggs below skin pockets that jut out from their belly areas -- brood patches. These patches are home to blood vessels that can send heat over to the whitish-green eggs. Female king penguins only deposit one egg at a time. This incubation adaptation enables king penguins to reproduce successfully in extremely frigid environments, as they don't have to place their eggs onto the ground. When king penguins are on terra firma, they use their bodies to avoid placing their feet into direct contact with the uncomfortable icy landscapes. They do this by tilting their feet toward the sky, and therefore applying the full weight of their physiques onto their tails and the back portions of their feet. Emperor penguins (Aptenodytes forsteri) also share in this adaptation. King penguins are notably big penguins. The only penguins that are bigger than them are the aforementioned emperor penguins -- their nearest kin. They share more in common than just impressive size, however, and that includes some survival adaptations. Emperor penguins have a few adaptations that king penguins lack, though. One involves the feathering of their feet. Emperor penguins simply have more of it than the king penguins. If you observe an emperor penguin's feet, his toes are the sole parts you can actually see.